all photos this page are thumbnails... you know what to do. "No man ever wetted clay and then left it, as if there would be bricks by chance and fortune." The Romans made fired clay bricks, and the Roman legions, which operated mobile kilns, introduced bricks to the whole of the Roman Empire. 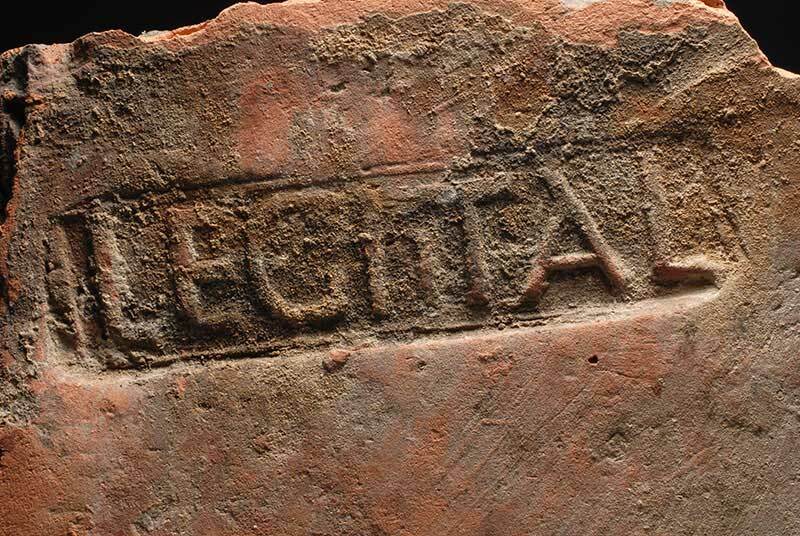 Roman bricks are often stamped with the mark of the legion that supervised their production. The use of bricks in southern and western Germany, for example, can be traced back to traditions already described by the Roman architect Vitruvius. Preferring to make their bricks in the spring, the Romans held on to their bricks for 2 years before they were used or sold. They only used clay which was whitish or red for their bricks. The kiln fired bricks were generally 1 or 2 Roman feet by 1 Roman foot, but with some larger bricks at up to 3 Roman feet. [a note: a Roman foot was 0.971 ft -- I'm not a great mathematician, you'll have to do your own calculations. Metric too, I am not a metric person ~DMV] The Romans preferred this type of brick making during the first century of their civilisation and used the bricks for public and private buildings all over the empire. The Constantine Basilica in Trier utilises Roman brick. Roman brick was almost invariably of a lesser height than modern brick, but was made in a variety of different shapes and sizes.Shapes included square, rectangular, triangular and round, and the largest bricks found have measured over three feet in length. Ancient Roman bricks had a general size of 1½ Roman feet by 1 Roman foot, but common variations up to 15 inches existed. Other brick sizes in Ancient Rome included 24" x 12" x 4", and 15" x 8" x 10". Ancient Roman bricks found in France measured 8" x 8" x 3". The Constantine Basilica in Trier is constructed from Roman bricks 15" square by 1½" thick. There is often little obvious difference (particularly when only fragments survive) between Roman bricks used for walls on the one hand, and tiles used for roofing or flooring on the other, and so archaeologists sometimes prefer to employ the generic term Ceramic Building Material (or CBM). 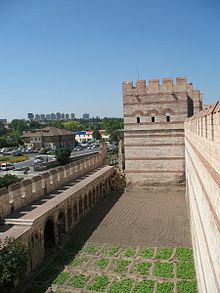 The city walls of Constantinople, showing several courses of brickwork. 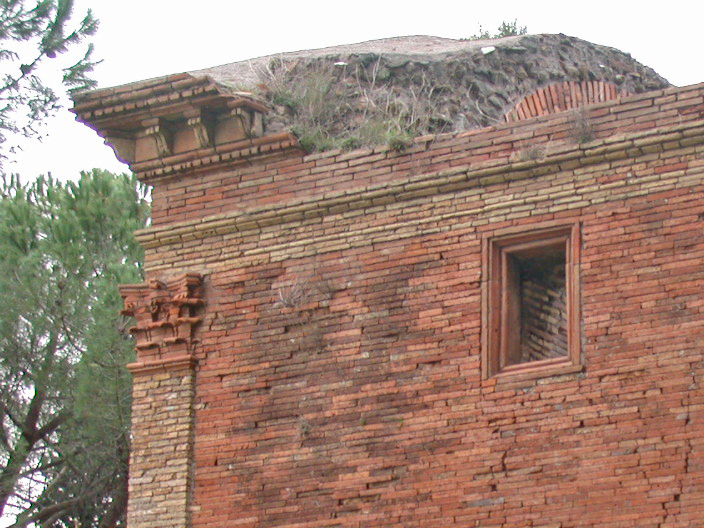 The Romans perfected brick-making during the first century of their empire and used it ubiquitously, in public and private construction alike. The Romans took their brickmaking skills everywhere they went, introducing the craft to the local populations. 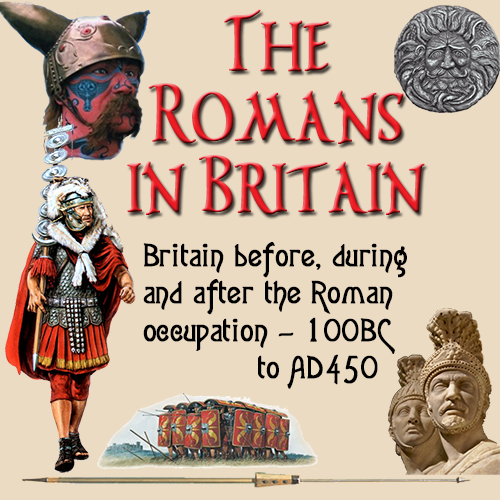 In the British Isles, the introduction of Roman brick by the Ancient Romans was followed by a 600? ? 700 year gap in major brick production. 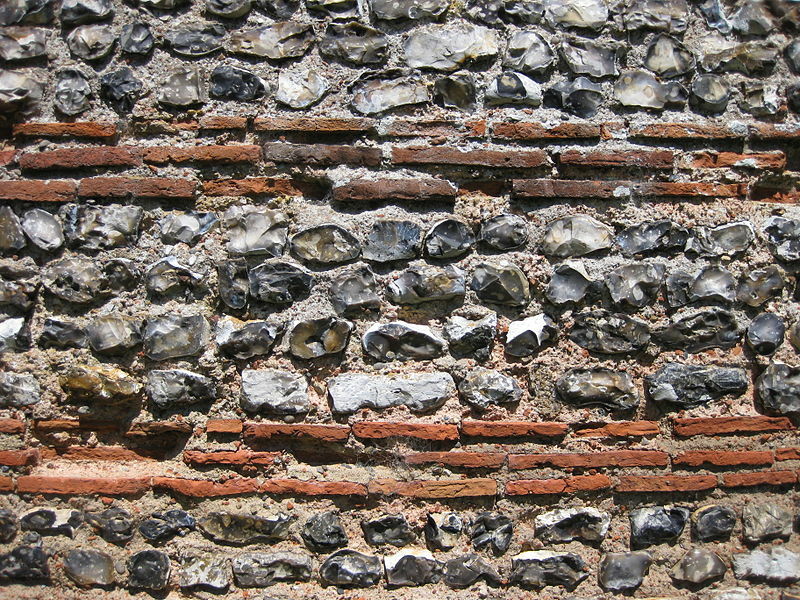 When building in masonry, the Romans often interspersed the stonework at set intervals with thin courses of bricks, sometimes known as "bonding tiles." This practice gave the structure added stability. It also had a secondary aesthetic effect of creating a polychromatic appearance. 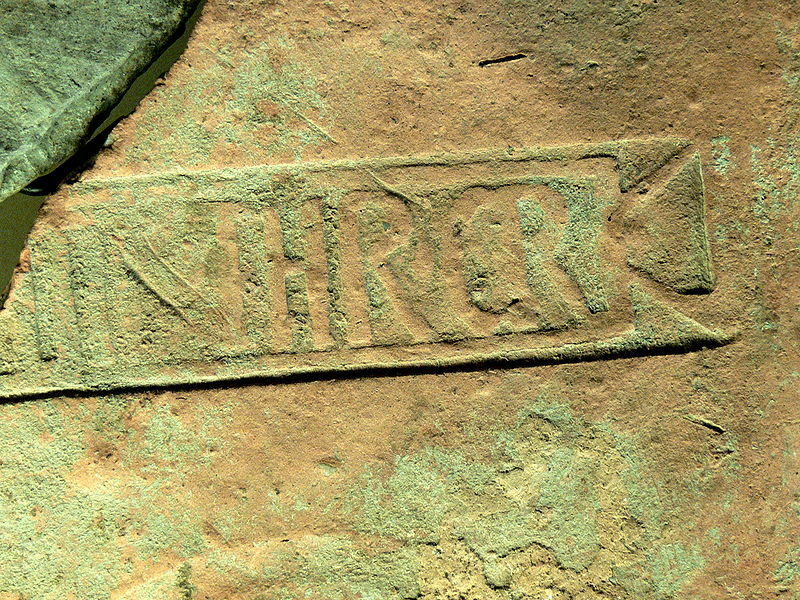 Ancient Roman stamp on a hypocaust brick, used by the third cohort of Roman citizens from Thrace. 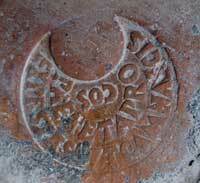 Around the middle of the 1st century BC Roman brick makers began using unique identifying stamps on their bricks. This was done because the brick factories were responsible for their quality and so they could be held responsible for defective products. The first of these brick stamps were simple and included minimal information such as, the name of a person and sometimes the name of the brickyard the brick was produced in. 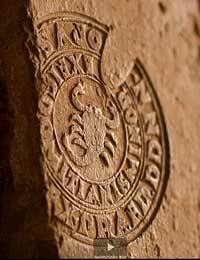 These earliest Roman brick stamps were emblazoned into the wet clay using a hardwood or metal mold prior to the firing of the brick. As the early Roman Empire progressed fired brick became the primary building material and the number of brick producers increased dramatically as more and more wealthy land owners began to exploit clay deposits on their land for brick-making. 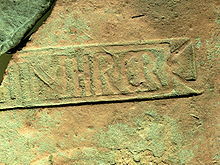 Brick stamps began to become more complex and include more and more information. 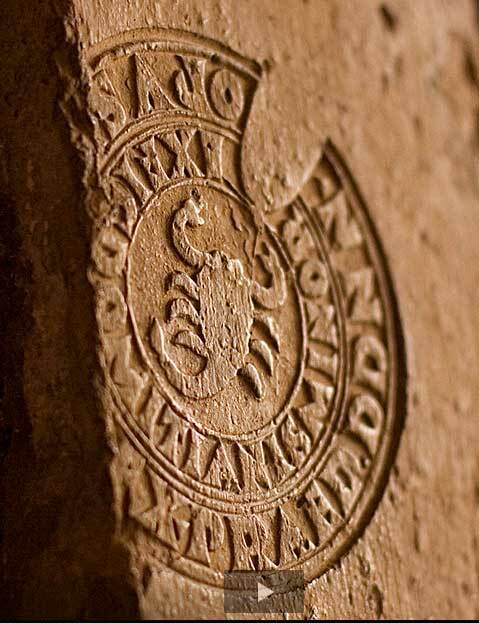 In 110, the stamps included, for the first time, the name of the consuls for the year of production, which allows modern observers to pinpoint the year a brick was created. 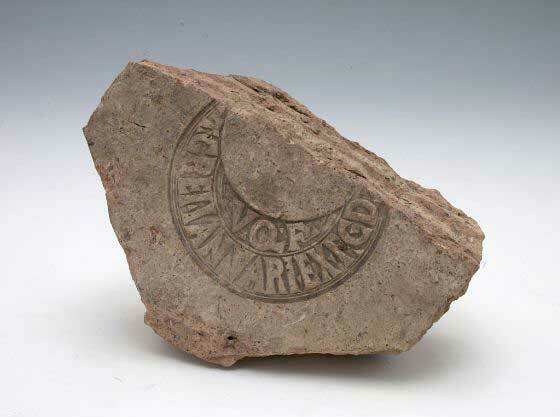 These brick stamps, once viewed more as a curiosity than archaeological artifacts, allow scholars to learn about the demand for bricks in Ancient Rome because through the dates on the stamps they provide a chronology. 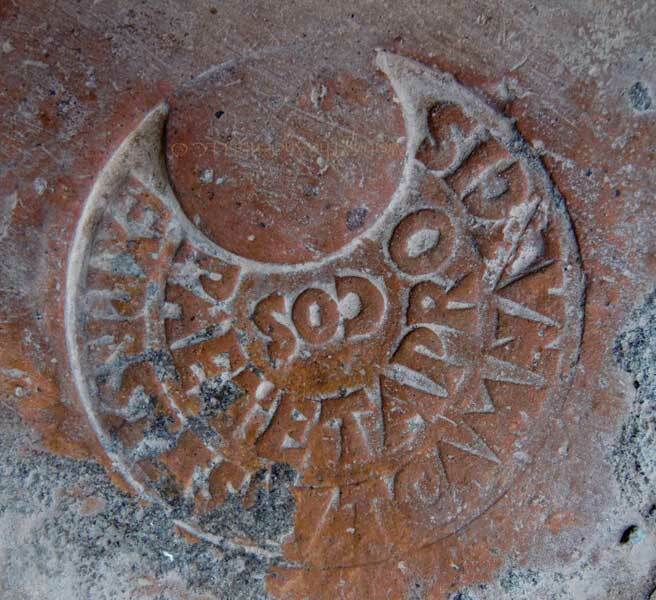 Today, brick stamp discoveries are carefully documented and that documentation, combined with the use of architectural context, has helped provide a reliable method of dating Ancient Roman construction. 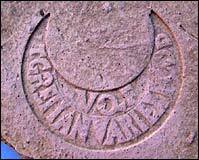 In addition, brick stamps have proved helpful in determining general Ancient Roman chronology. Brickstamp with Latin stamped impression inscription: "FF...AVCC'ET, C^ESS'NN" in the center of circle SR.
Brickstamp with from Tullus and Lucanus Domitius brick works. Article here. 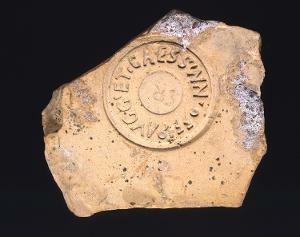 This brick, found in Ostia Antica, is stamped with the Consular names Paetinus and Apronianus ? ? Consuls in the year AD 123. One of the things the Romans are most famous for is their architecture. The Romans brought a lot of new ideas to architecture, of which the three most important are the arch, the baked brick, and the use of cement and concrete. Romans built the first major public bath building in Rome. and also the Hadrian? ?! "s Pantheon, a temple to all the gods, which used brick and concrete to build a huge dome. There is a species of sand which, naturally, possesses extraordinary qualities. It is found about Baiæ and the territory in the neighbourhood of Mount Vesuvius; if mixed with lime and rubble, it hardens as well under water as in ordinary buildings. This seems to arise from the hotness of the earth under these mountains, and the abundance of springs under their bases, which are heated either with sulphur, bitumen, or alum, and indicate very intense fire. The inward fire and heat of the flame which escapes and burns through the chinks, makes this earth light; the sand-stone (tophus), therefore, which is gathered in the neighbourhood, is dry and free from moisture. Since, then, three circumstances of a similar nature, arising from the intensity of the fire, combine in one mixture, as soon as moisture supervenes, they cohere and quickly harden through dampness; so that neither the waves nor the force of the water can disunite them. (translated by Joseph Gwilt, London: Priestley and Weale, 1826 - digital text by Bill Thayer). Most Roman buildings are made up of opus caementicium, a sort of concrete which was laid into timber structures until it hardened. The resulting walls were very solid, but not nice to see, so very often some sort of facing was applied. 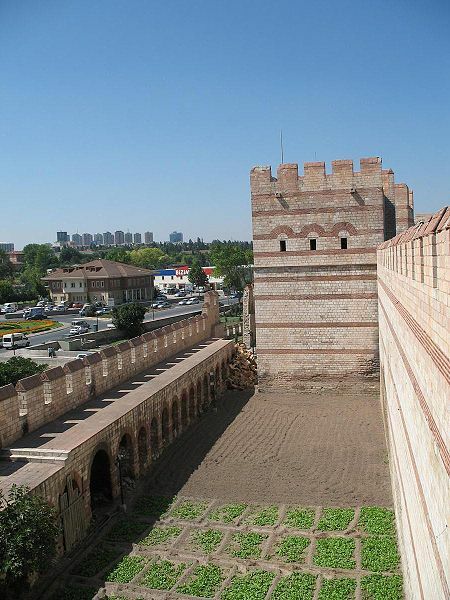 (left) Roman bricks at S. Saba; (centre) walls supporting the Imperial Palaces; (right) brick decoration at Anfiteatro Castrense. The Romans made use of fired bricks; the manufacturing of bricks was perfected during the first century AD: factories branded their products as they were responsible for their quality; bricks were generally longer and narrower than the bricks we use today. There were also round and triangular bricks which were used to imitate columns and other architectural motifs. 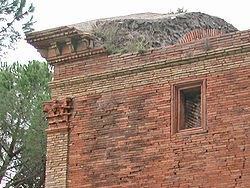 Brickwork (opus latericium) at Pantheon (left) and at Palazzo Madama (right). The way the bricks were laid is often associated with a specific period: the texture of course-laid brickwork at the time of Emperor Hadrian impressed Renaissance architects who imitated it in many buildings. Contemporary architects have used "Roman brick" too. "Opus reticulatum" at Villa Adriana (left) and near S. Saba (right). An unusual kind of facing was based on specially-shaped tufa stones: the points of the stones were inserted into opus caementicium, while their square bases formed a diagonal pattern resembling a fishing net (reticulatum). Today many streets of Rome are paved with porphyry stones which create a similar diagonal pattern. (left) "Opus listatum" at Porta S. Paolo; (right) "Opus mixtum" at Delphi. 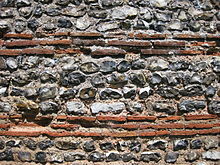 Bricks were relatively expensive and their laying required a lot of manpower: for these reasons in the last centuries of the Roman Empire new facing patterns were developed to reduce the use of bricks; they were replaced by tufa pieces or by other materials including pieces of marble and other stones coming from ruined buildings. This resulted in a stripe design which characterized the buildings of the Late Empire as showed by the walls of Constantinople. These stripes passed on to Byzantine Art; they then influenced the design of Muslim mosques to finally return to Italy, where many medieval cathedrals (e.g. Orvieto) were decorated with black and white stripes.